Ever since I can remember, each summer has had a theme, an idea that connects events and experience. Sometimes it’s as simple as “the summer of naps” or “the summer of adventure.” This summer’s theme is more serious and important. At the start of the workshop, we had to commit to participating. I was worried. I didn’t want to participate actively. What, after all, can I offer as a white woman? It’s not my fight and I don’t have any credibility. I’ll be happy to just sit politely and listen. It’s really lonely. That struck me. It’s lonely speaking up, constantly, day after day. It’s lonely being the only one in a room with certain experiences and beliefs. It’s lonely working to make change and justice in a hostile system. The summer wore on. There was Baton Rouge. And then there was Minneapolis. And then there was Dallas. And then there were the Conventions. And then. Then there was the cousin on Facebook. This relative, and others, claimed that Michelle was subliminally preaching racial division. This, from a white man in a place of privilege in his community. This, from white people who have nearly always had the upper hand in this country. I was astounded. I was disgusted. And then, it made sense. Only people from such a privileged background would interpret Michelle’s line that way. Of course they’d see a historical reference couched in the context of progress as divisive commentary, aimed at knocking them off their protected perch. In exactly the way Black Lives Matter (BLM) has been painted as racist, this inverted logic stubbornly refuses—once again—to accept both the historical facts of our country and the contemporary picture that makes BLM so relevant and necessary. It defines and deflects every assertion by people of color as an attack. I grew up in the South. I do not pretend to understand what it means to be Black, but I do understand what it means to be white in a racist society. I thought, when I moved away from the South, that I had mostly escaped it. But this summer of national conversations on race and equity has brought all the feelings back. I implicitly understand what this divisiveness means, how it feels, what it looks like on sidewalks, in hair salons, and in classrooms. And I realized that unless I speak up, I’m still part of the problem. As I return to school this fall and recommit myself to my students and my purpose in supporting equity here in my own community, I also commit myself to speaking up. If I’m not a disrupter or an interrupter, then I’m an enabler. If I do nothing, evil will prevail. I will teach my students to embrace each other in all our diversity, because that’s what has always made America great. If for no other reason, we do this because joining with others undercuts divisiveness by building community, replaces loneliness with solidarity, and is the most human activity we can pursue. 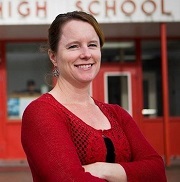 Anna Baldwin is the 2014 Montana State Teacher of the Year and a member of the National Network of State Teachers of the Year. She teaches English at Arlee High School in Arlee, Montana.